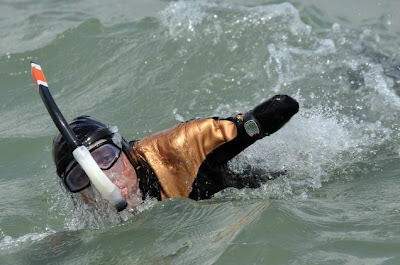 A Frenchman whose arms and legs were amputated swam across the English Channel this weekend using leg prostheses that have flippers attached.Philippe Croizon (42) had expected the tough crossing to take up to 24 hours — and instead, he finished in only 13-and-a-half. “I did it, I'm happy, I'm so happy, I can't believe it, it's crazy,” he told France-Info radio, sounding giddy on arrival late Saturday.Three dolphins joined him for a while.“We took that as a sign of good luck,” the swimmer's father, Gerard Croizon, told The Associated Press.Mr. Croizon set off from Folkestone on the British side of the English Channel and arrived near the French town of Wissant. At the narrowest point, the crossing is about 34 km. 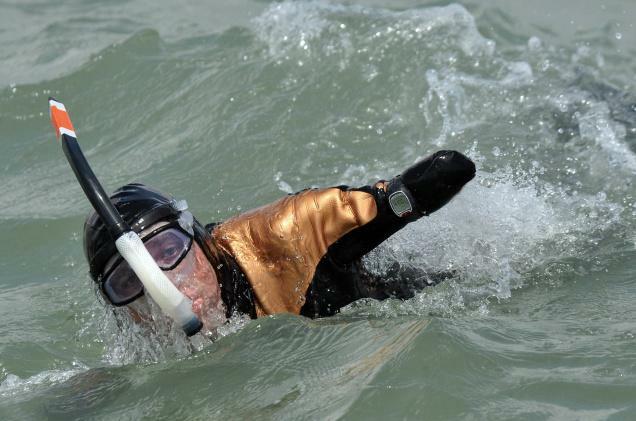 Mr. Croizon's specially designed leg prostheses, which end in flippers, allow him to propel himself through the water. His truncated upper arms go through the motions of the crawl, and he breathes through a snorkel.The swimmer lost his arms and legs after suffering an electric shock in 1994 as he stood on a ladder adjusting his television antenna, which touched a power line. Mr. Croizon made headlines in 2007 for parachuting from an airplane. He wrote a book about his experiences called J'ai decide de vivre (I decided to live).